Hi there! Today’s post presents you the study Tidal constraints on the interior of Venus, by Caroline Dumoulin, Gabriel Tobie, Olivier Verhoeven, Pascal Rosenblatt, and Nicolas Rambaux. This study has recently been accepted for publication in Journal of Geophysical Research: Planets. The idea is: because of its varying distance to the Sun, Venus experiences periodic variations. What could their measurements tell us on the interior? Venus is sometimes called the twin sister of the Earth, because of its proximity and its size. However, their physical properties show crucial differences, the most crucial one being the atmosphere. it has no magnetic field. For a magnetic field to exist, you need a rotating solid core, a global conductive fluid layer, and convection, which is triggered by heat transfers from the core to the mantle. The absence of magnetic field means that at least one of these conditions is not fulfilled. Given the size of Venus and its measured k2 by the spacecraft Magellan (explanations in the next section), it has probably a fluid global layer. However, it seems plausible that the heat transfer is missing. Has the core cooled enough? Is the surface hot enough so that the temperature has reached an equilibrium? Possible. Probing the interior of Venus is not an easy task; an idea is to measure the time variations of its gravity field. The orbital eccentricity of Venus induces variations of its distance to the Sun, and variations of the gravitational torque exerted by it. Since Venus is not strictly rigid, it experiences periodic deformations, which frequencies are known as tidal frequencies. These deformations can be expressed with the potential Love number k2, which gives you the amplitude of the variations of the gravity field. Since the gravity field can be measured from deviations of the spacecraft orbiting the planet, we dispose of a measurement, i.e. k2 = 0.295 &pm; 0.066. It has been published in 1996 from Magellan data (see here a review on the past exploration of Venus). You can note the significant uncertainty on this number. Actually k2 should be decorrelated from the other parameters affecting the trajectory of the spacecraft, e.g. the flattening of the planet, the atmosphere, which is very dense, motor impulses of the spacecraft… This is why it was impossible to be more accurate. the topographic Love number h2, which quantified the deformations of the surface. 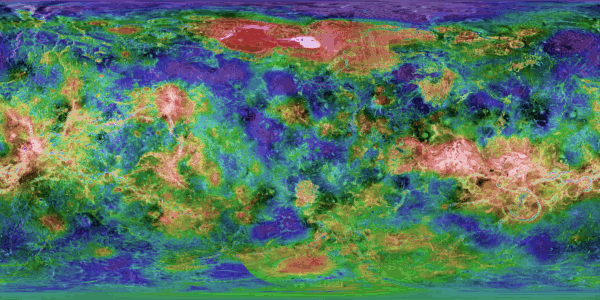 Observing the surface of Venus is a task strongly complicated by the atmosphere. Magellan provided a detailed map thanks to a laser altimeter. Mountains have been detected. But these data do not permit to measure h2. The dissipation function Q. If I consider that the deformations of the gravity field are periodic and represented by k2 only, I mean that Venus is elastic. That mean that it does not dissipate any energy, it has an instantaneous response to the tidal solicitations, and the resulting tidal bulge always points exactly to the Sun. Actually there is some dissipation, which results as a phase lag between the tidal bulge and the Venus – Sun direction. Measuring this phase lag would give k2/Q, and that information would help to constrain the interior. Such a large body is expected to be denser in the core than at the surface, and is usually modeled with 3 layers: a core, a mantle, and a crust. Venus also have an atmosphere, but this is not a very big deal in this specific case. These are not necessarily homogeneous layers, the mantle and the core are sometimes assumed to have a global outer fluid layer. If this would happen for the core, then we would have a solid (rigid) inner core, and a fluid (molten) outer core. This interior must be modeled to estimate the tidal quantities. More precisely, you need to know the radial evolution of the density, and of the velocities of the longitudinal (P) and transverse (S) seismic waves. These two velocities tell us about the viscosity of the material. PREM is the Preliminary Reference Earth Model. It was published in 1981, and elaborated from thousands of seismic observations. Their inversions gave the radial distribution of the density, dissipation function, and elastic properties for the Earth. It is now used as a standard Earth model. The lack of data regarding the core of Venus prompted the authors, and many of their predecessors, to rescale PREM from the Earth to Venus. The properties of the mantle of Venus depend on its composition and the radial distribution of its temperature, its composition itself depending on the formation of the planet. The authors identified 5 different models of formation of Venus in the literature, which affect 5 variables: mass of the core, abundance of uranium (U), K/U ratio (K: potassium), Tl/U ratio (Tl: thallium), and FeO/(FeO+MgO) ratio (FeO: iron oxide, MgO: magnesium oxide). Only 3 of these 5 models were kept, two being end-members, and the third one being pretty close to the Earth. These 3 models were associated with two end-members for temperature profiles, which can be found in the scientific literature. This then resulted in 6 models, and their properties, i.e. density and velocities of the P- and S-waves, were obtained thanks to the Perple_X code. This code gives phase diagrams in a geodynamic context, i.e. under which conditions (pressure and temperature) you can have a solid, liquid, and / or gaseous phase(s) (they sometimes coexist) in a planetary body. 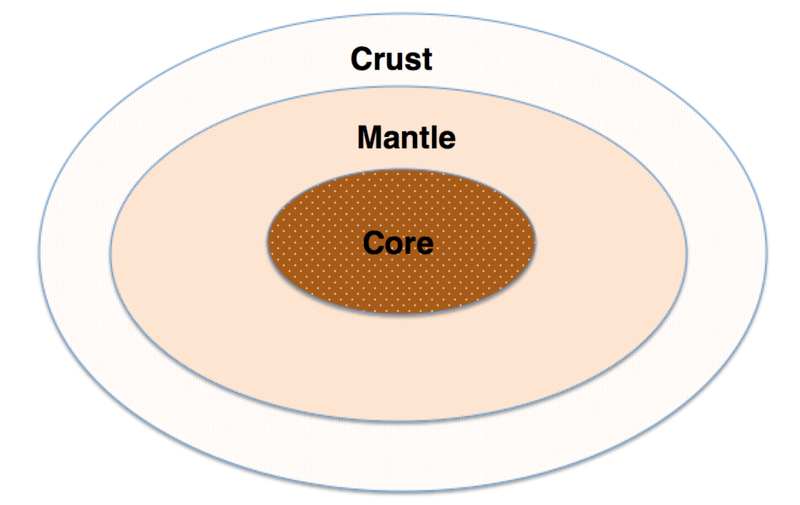 Once the core and the mantle have been modeled, a 60-km-thick crust have been added on the top, and then the tidal quantities have been calculated. For that, the authors used a numerical algorithm elaborated in Japan in 1974, using 6 radial functions y. y1 and y3 are associated with the radial and tangential displacements, y2 and y4 are related to the radial and tangential stresses, y5 is associated with the gravitational potential, while y6 guarantees a property of the continuity of the gravitational force in the structure. These functions will then give the tidal quantities. The results essentially consist of a description of the possible interiors and elastic properties of Venus for different values of k2, which are consistent with the Magellan measurements. But the main information is this: Venus may have a solid inner core. Previous studied had discarded this possibility, arguing that k2 should have been 0.17 at the most. However, the authors show that considering viscoelastic properties of the mantle, i.e. dissipation, would result in a smaller pressure in the core, i.e. <300 GPa, for a k2 consistent with Magellan. This does not mean that Venus has a solid inner core, this just means that it is possible. Actually, the authors also get interior models with a fully fluid core. The atmosphere would alter k2 by only 3 to 4%. The authors claim that the uncertainty on k2 is too large to have an accurate knowledge on the interior, and they hope that future measurements of k2 and of k2/Q, which has never been measured yet, would give better constraints. For this hope to be fulfilled, we should send spacecrafts to Venus in the future. The authors mention EnVision, which applies to the ESA M5 call (M for middle-class). This is a very competitive call, and we should know the finalists very soon. If selected, EnVision would consist of an orbiter on a low and circular orbit, which would focus on geology and geochimical cycles. It should also measure k2 with an accuracy of 3%, and give us a first measurement of k2/Q. In America, two missions to Venus have been proposed for the Discovery program of NASA: VERITAS (Venus Emissivity, Radio Science, InSAR, Topography, and Spectroscopy) and DAVINCI (Deep Atmosphere Venus Investigation of Noble gases, Chemistry, and Imaging). They have both been rejected. The study. Preliminary results had been presented at scientific conferences before publication, you can find here an extended abstract, and here a poster. Hi there! Today’ post will be my first on Venus. More precisely, it deals with its atmosphere. As you may know, the planet Venus is known for its very thick atmosphere, which precludes optical observations of its surface. The study I present today is entitled “Discovery of a 150 day period in the Venus condensational clouds”, by Kevin McGouldrick and Constantine Tsang, who work in the city of Boulder, CO (I love this place). This study has been recently accepted for publication in Icarus. Venus is the second innermost planet of the Solar System, which means that its orbit is interior to the one of the Earth. It is sometimes said to be a twin sister of the Earth because its diameter is 95% the diameter of the Earth. However, the meteorological conditions make it a very hostile place for life. The surface pressure is ~93 times the one of the Earth, the temperature is about 470˚C, and the atmosphere is essentially made of carbon dioxide. Its rotation is very interesting, since it rotates very slowly, and in the retrograde direction. It has a rotation period of 245 days, while its orbital period around the Sun is only 225 days. This means that a Venusian day is longer than a Venusian year. This peculiar rotational state could result from the atmospheric tides, i.e. the way the dense atmosphere interacts with the gravitational forcing of the Sun, loses some energy, and also interacts with the surface. However, the atmosphere moves much faster, with a period of about 4.2 days. 1962: Mariner 2 (USA). This probe was the first one to perform successfully a flyby of another planet than the Earth. It proved that the surface was hot, detected no magnetic field, and it improved our knowledge of the mass of the planet. Beside these results of Venus, it made measurements of the Solar wind and allowed many technological improvements in space navigation and telecommunication. 1965: Venera 4 (USSR), Mariner 5 (USA). Venera 4 crashed on Venus after a fall in the atmosphere with a parachute, permitting the first in situ measurements of its chemical composition, and detection of a weak magnetic field, which Mariner 2 could not have detected. Mariner 5 made a flyby of Venus and analyzed its outer atmosphere. 1969: Venera 5 & 6 (USSR) were technologically similar to Venera 4, but with specific improvements of the analysis of the atmosphere, based on the results of Venera 4. 1970: Venera 7 (USSR) was the first probe to land on another planet than the Earth and to transmit data from the surface. It made the first accurate measurement of the temperature and the pressure at the surface. 1972: Venera 8 (USSR) showed that the atmosphere of Venus was pretty clear below 50 km, meaning that the clouds had a higher altitude. 1975: Venera 9 & 10 (USSR). These two probes were the first ones to send images of the surface of another planet than the Earth. Moreover, Venera 10 measured the velocity of the wind. 1978: Venera 11 & 12 (USSR), Pioneer Venus Multiprobe (USA). Venera 11 & 12 made more accurate measurements of the composition of the atmosphere, and detected lightning and thunder. Pioneer Venus Multiprobe launched 4 probes to the surface of the planet, to analyse the atmosphere during their fall. One of these probes survived the impact, but did not have any imaging instrument. These probes identified 3 layers of clouds in the atmosphere. 1978-1992: Pioneer Venus Orbiter (USA). This spacecraft was the companion of Pioneer Venus Multiprobe, and was inserted into orbit on Dec 4th 1978. Its orbit was very eccentric (0.8), and it contained 17 instruments, allowing to study the magnetic field of Venus, its gravity field, its atmosphere… It also monitored the water loss of the Halley’s comet in 1986. 1981: Venera 13 & 14 (USSR) were landers, they made measurements of the atmosphere during the fall and took images of the surface. 1983: Venera 15 & 16 (USSR). These probes were orbiters equipped with radars. They mapped ~25% of the surface. 1984: Vega 1 & 2 (USSR + Europa). These two probes made a flyby of Venus to launch a lander devoted to make measurements of the atmosphere. After the flyby, the probes approached Halley’s comet and took ~1,500 images of it. 1990: Flyby by Galileo (USA). Galileo was sent to Jupiter, but used the gravitational assistance of Venus on its way. This was the opportunity to study the composition of the clouds of Venus, in comparing the measurements at 1.74 and 2.30 μm, i.e. in the infrared. These two bandwidths correspond to minimal absorption by carbon dioxide and by water, so they can be used not only to detect a signal from the surface of Venus, i.e. the Solar light reflected by the surface, but also to estimate the temporal evolution and the composition of the clouds. 1990-1994: Magellan (USA). This orbiter studied the gravity field of the planet, and also provided a detailed map. It particularly revealed the presence of many volcanoes, few impact craters and large lava plains, meaning that the surface is geologically young, and evidence of some tectonic activity, which is pretty different than the terrestrial one. It was revealed by low domical structures called coronae, produced by the upwelling and subsidence of magma from the mantle. 1998-1999: 2 flybys by Cassini (USA), on its way to Saturn. 2006-2015: Venus Express (Europa), see next paragraph. Since 2015: Akatsuki (Japan). This spacecraft should have orbited Venus since 2010, but that maneuver failed. It then orbited the Sun during 5 years in safe mode before succeeding another orbital insertion in December 2015. This spacecraft essentially studies the dynamics of the atmosphere of Venus during a 2 year regular scientific mission, which has started in May 2016. This ESA spacecraft has been launched in November 2005, and was inserted in orbit in April 2006, originally for a 2-year mission… which was completed 9 years later! The main objective of that mission was to understand the dynamics of the atmosphere of Venus, with the hope of a better understanding of the atmospheric evolution in general. It contained 7 instruments, 3 of them being devoted to spectrometry (VIRTIS, SPICAV and PFS), one to radioscience (VeRa, for Venus Radioscience), one was a magnometer (MAG), one for imaging (VMC, for Venus Monitoring Camera), and the last one, ASPERA-4, investigated the interaction between the Solar wind and the Venusian atmosphere. We are today particularly interested by VIRTIS, for Visible and Infrared Thermal Imaging Spectrometer, which measured the emitted radiance in 1.74 μm and 2.30 μm of the night-side of Venus. Venus Express had a polar and highly eccentric orbit. Its high eccentricity resulted in a large variation of the distance between the probe and the planet, i.e. from 460 to 63,000 km, with a period of 24 hours. As a consequence, the field of view and resolution of the measurements experienced large variations. An interesting thing to notice is the fact that Venus Express reused some technologies designed for Mars Express and Rosetta. Mode 3 particles, with a diameter of 7 μm, are expectd in the lower region. So, for our lower clouds, we expect only Mode 2′ and Mode 3 particles. The authors used VIRTIS data, and after denoising they averaged the measurements over 7 days, since they are interested only in the long-term dynamics. Since the atmosphere is rotating, the authors could thus only detect variations in time and in latitude, but not in longitude. And the results are these: the radiance steadily increases at mid-latitudes, while it decreases near the poles, which could reveal a circulation of clouds over a very-long term. This long-term variation should be a periodic effect, which future measurements by Akatsuki should help to understand. Moreover, the authors noticed a 150-day periodic variation in the cloud coverage, especially in the 1.74 μm radiance data, at mid-latitude. This is an unexpected result, which had already been hinted by the same authors 4 years before, with less data. The cause of this periodicity still needs to be elucidated. The authors notice that this period is almost two thirds of the rotation period of Venus, but this may be by chance. This could be the manifestation of a Hadley-like circulation, i.e. a kind of circular motion of the atmosphere driven by variations of its temperature, itself controlled by the latitude and the altitude. The study made freely accessible by the authors who paid for Open Access. Thanks to them for sharing!